All printers should be thinking about “workflow automation” as a strategic initiative; produce more with less labor, less waste, in less time as a way to remain competitive. Time savings should be strategically invested in diversification, new skills acquisition, and cross-training. When the industry talks about workflow automation, we love to dive right into the weeds of pre-press, imposition, and the production floor. Workflow automation is a strategic initiative to make your overall business more efficient in an environment of increased order volumes, decreased turnaround times, and lower average run lengths. The foundation of workflow automation is answering the question “WHY?” for your staff via well communicated business objectives. When you don’t answer the “WHY?” people make up reasons for initiatives which usually involves some level of job loss paranoia. Workflow automation is about increasing your capacity without increasing your costs. Can you make your company capable of producing twice what you’re producing today without adding more staff, another shift, or driving your current staff crazy? The foundation of workflow automation starts with executive support/leadership that guides the project towards clearly defined business objectives. The more clearly you define your business objectives, e.g. “20% decrease in time spent invoicing each month” the better. In order to measure your progress you have to take a baseline measurement. How long does it currently take you to complete invoicing each month? On average how long does it take to generate an accurate invoice? What is your “lag time” between shipping products and invoicing customers for those services? What is your average response time to a request for quote/estimate? Get these baseline measurements FIRST, and then you can set clear metrics for how you want to improve them. When you are improving the efficiency of your staff it is vitally important that you have a PLAN for how they will spend their extra time. Do you have strategic projects that never get attended to? Would you like to reduce overtime? Do you want to cross train staff members? Don’t free up time without a plan to leverage that time to improve your business. Automation is only possible when your business has a well implemented system of record (Print MIS). It is impossible to automate unless you have a handle on how jobs flow through your shop and how labor and raw materials are consumed in the process. Your Print MIS is a critical factor in how far you can go with automation. In shops where Print MIS systems are half implemented or there are lots of workarounds (in the form of spreadsheets, paper based workflows, and open loops), automation efforts break down quickly. Automation has to be all-inclusive, both your production workflow and your business workflow. Often there is more wasted time and effort on “front office” parts of your workflow (order entry and invoicing) then there are on the production side. Find all your bottlenecks – check everywhere, not just production. Automation inevitably means building an integrated workflow that passes through a mixed vendor environment. Your jobs could traverse through as many as 10 different technologies in the course of creating that final product and that final business transaction (the invoice). Integration is required to reduce labor, create efficiencies, and removing manual steps in your process. The foundation of an integrated workflow is an up-to-date (upgraded), modern, technology stack in a reliable IT infrastructure. This part of the project can take weeks or months to iron out depending on the complexity of your technology stack, the willingness of your vendors to cooperate, and your technical resources availability and skill sets. When integration breaks down, the first thing vendors ask is “what version are you on?” It’s a maddening cycle of trying to make things work in spite of all the component pieces all moving independently of each other. Never do an upgrade without considering the impacts both upstream and downstream in your workflow. The next step in the process is putting your “pattern recognition hat” on and looking at your business in the form of job characteristics and job paths. Step back from the individual job perspective (where everything looks 100% unique) and find the patterns in your business. Are incoming jobs known or unknown? When they are known, how much do you know about them? What varies about them each time they are submitted? Are they priced or estimated every time? Does every job really deserve an estimate? (see my article about this very subject). What is the expected turnaround time? Is there anything that makes this job “special” if so, where are those special instructions captured? Each job travels through your business via a specific journey. There are patterns here too, you have to step back to see them. A job that comes in from a web-to-print system and ends up on your digital press takes one journey, while a job that gets walked in by a sales representative and gets printed on your wide format devices takes another. It is shocking to me how many print businesses we interact with where these job paths have never been described or documented. A key to automation is to assess where you are today in order to find out what is causing the most pain in the form of labor, errors, and waste. You have to get an understanding of the kinds of jobs (job characteristics) that you’re dealing with and the journey’s those jobs are traveling (both business and production journeys). 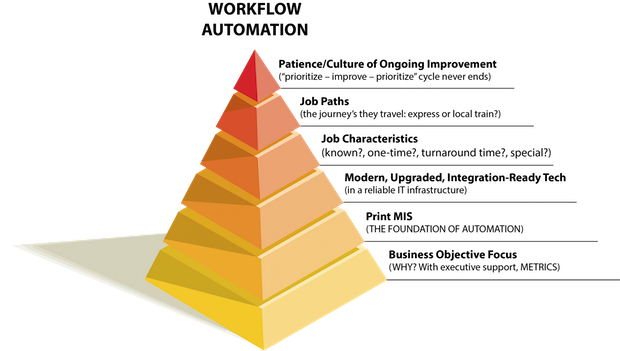 The final piece to our workflow automation pyramid is “patience”. Think of workflow automation as “continuous improvement” that will never end. Your business is constantly changing, your customers are constantly changing, and your technology stack is constantly changing. Your workflow has to adapt to all these changes. We like to apply the “agile methodology” to our workflow automation projects. In short, we analyze the workflow; prioritize 3-5 areas that align with the business objectives and would produce measurable ROI. We tackle those 3-5 areas in a “sprint” that lasts a couple of weeks. At the end of the sprint we re-cap our efforts, prioritize again, and then rinse and repeat. This methodology creates a culture of IMPROVEMENT and FOCUS. You are constantly looking for areas of improvement, focusing your attention in those areas, executing on them, and then moving on. This process sounds like the good strategic meetings I have at clients, when the right people are in the room. For those experiencing this paranoia, you should be paranoid. Why? Yes, I asked why? You should be making yourself more valuable everyday so you don't go to bed paranoid. Be part of the improvement... everyday! Thanks Paul. We need to bring these discussions into every printer AND make people understand the importance of thinking this way. The status quo is not a survival strategy. As my father used to say, "someone is out there trying to do it better, faster, and cheaper" so your improvement process can never stop." Jen, good read as always. Why do you think the print industry is so obsessed with true automation while leaders in the manufacturing world outside of print focus on automation + process improvement? Toyota, by the way, is a great example from outside print. In my experience, the print providers with the most automation have small pockets of it overall if you look at the entire process end to end. My point is that I wonder if "automation" is really the goal. Or is it overall manufacturing efficiency, where automation appears to be the magic bullet. When in reality it is a piece of the puzzle. You talk about automation in your article and starting with the steps you suggest about mapping out workflows is hugely valuable for kickstarting process improvement. From there it is easier to use automation as a tool among many where it makes sense. Great advice. Sometimes I think vendors and industry pundits(not you, of course!) set the bar too high sometimes. I love this article, too - you always are so spot on Jennifer. It's really necessary to take action on this to be able to have a healthy and sound business. The main reason for why this is so hard to take action on is, in my believe, the consequences. This will lead to totally new ways of doing things and that demands a different mindset. Since we are working with an estimating tool I can give examples from that part of the workflow. When a sales rep immediately can give prices and tell the customer what affects the price, you do not only save time and can approach more customers. The entire discussion is different. 1) It moved from trying to collect data for as many quotes as possible (it take 100 quotes to get 10 orders mentality) to closing the deal right there and then. 2) Instead of negotiating prices they educate the print buyer of how the choices made determines the price. 3) The mindset is not to have the lowest price for a particular product. Its how do we get the most out of the dollars my customer wants to spend on print. And this is just a reflection from one part of the organisation. This is a great article Jennifer, which gives a complete overview of strategic approach of print workflow automation. This gives a clear picture of continuous improvement which will never end.